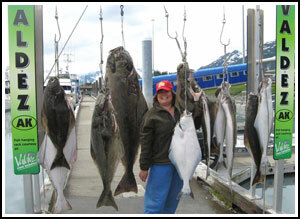 The Prince William Sound Charter Boat Association (PWSCBA) started as the Valdez Charter Boat Association in 1990 with 11 members. The name was changed to PWSCBA in April 2004 and now includes members in the Ports of Whittier and Cordova. One Valdez member, Ken Larson, started donating free Vet fishing trips in 2005 after returning from a 2004 – 2005 stint with USACE in Iraq as a resident engineer supporting his son’s First Cavalry Artillery Unit during Operation Iraq Freedom. A few more local charter operators picked up on the idea. In 2007 the City of Valdez and Crowley joined as partners to make Military Appreciation Weekend a formal event. This fantastic event continues to grow each year. Due to its popularity several generous private boat owners have also begun donating their time and boats so the Valdez event can accommodate more very deserving veterans. A Special Thanks! The Military Appreciation event would not be possible without the support and active participation of sponsors. The extraordinary fishing opportunity for our returning Hero's would not be possible without the generosity of charter and local boat owners. Several businesses will be offering discounts for the weekend. When making your reservations, ask for the military discount.